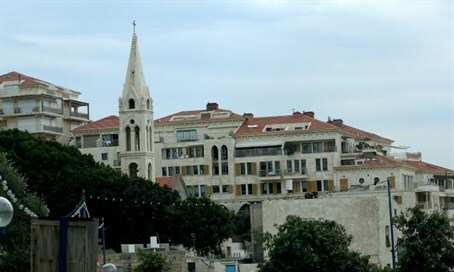 An Arab community leader vowed to 'fight the Judaization' of the Ajami neighborhood of Jaffa - a stone's throw from Tel Aviv. An Arab community leader on Monday gave an interview to the Hamas-backed Palestine newspaper complaining about a new Israeli “settlement." The “settlement” Sattel is referring to is not on a barren hilltop in Samaria, however; it's in the middle of Jaffa (Yafo), which was incorporated into the Tel Aviv municipality when the State of Israel was established in 1948. Jaffa has a substantial Jewish population, and is home to numerous important Israeli institutions – among them the broadcasting headquarters of Army Radio. In his comments, Sattel used the same terminology to describe Jaffa – far behind the 1949 Armistice Lines, and thus, ostensibly, “legal” - as critics of Jewish towns in Judea and Samaria. The “settlement,” said Sattel, consists of 63 apartments that are to be built in the predominantly Arab Ajami neighborhood. In order to prevent the project from being built, Sattel has appealed to various international groups, among them the Vatican. Sattel claims that some of the land the project is to be built on includes land owned by the Vatican.